The play’s title ‘Dagh Dagh Ujala’ (This Stained Dawn) refers to the first words of the Urdu poem ‘Subh-e-Azadi’ (Dawn of Freedom) by the acclaimed poet Faiz Ahmed Faiz. Penned in 1947 on the eve of India’s Independence from British rule and its bloody partition, the poem is popular on both sides of the border. 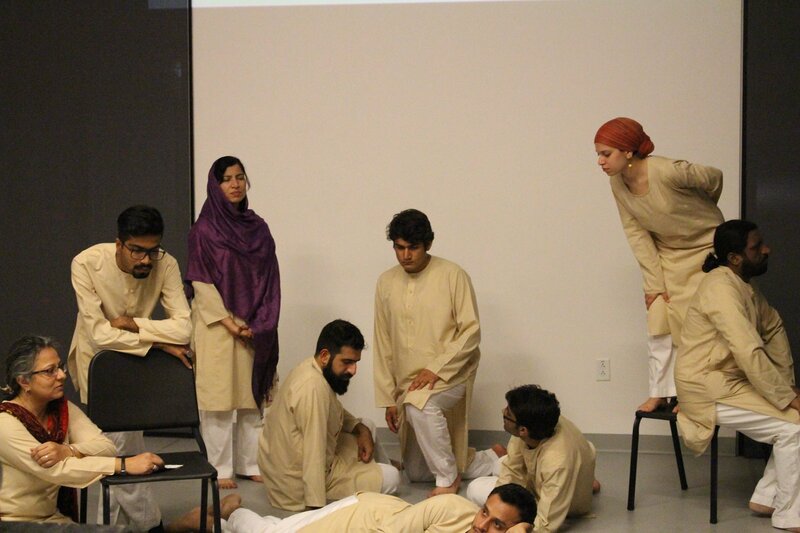 The play and the US tour are part of a five-part collaborative project, Voices of Partition that emerged from a meeting at a coffee shop in Islamabad in June 2013 between theatre practitioners from America and Pakistan. 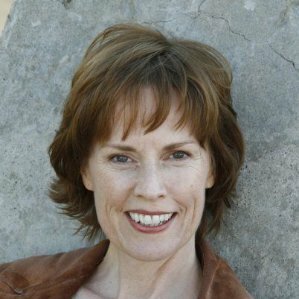 The Americans were Fullbright Specialist Kathleen Mulligan, associate professor of Voice and Speech at Ithaca College in upstate New York, her husband David Studwell, an actor, teacher and also a Fullbrighter, and their friend Rob Raines, then Cultural Attache at the US Embassy in Islamabad. Visiting Pakistan as a Fullbrighter since Aug 2012, Mulligan had become interested in collecting Partition stories and dramatising them. Raines knew a group who would be a potential partner: the Islamabad-based Theatre Wallay (‘theatre people’). Theatre Wallay (not related to the original Theatrewalay, the now defunct repertory company in Karachi started by famous television actor Rahat Kazmi in the 1980s) members include teachers (Hasan herself runs a school), poets, artists, writers, students and activists. Mulligan’s idea struck a chord with Theatre Wallay’s Fizza Hasan, a co-founder of the group, and senior member Safeer Khan, who has previously worked with the Lahore-based activist street theatre group Lok Rehas. Khan hails from a remote village in Kohat in northwestern Pakistan that was unaffected by the partition – nobody from his family or village had to migrate and no migrant settled in his area. Even those who had partition survivors in their families and had heard the stories gained a new understanding. They had never paid much attention, or understood how important it was to record these stories. All of them found the process of obtaining the narratives “intense”. 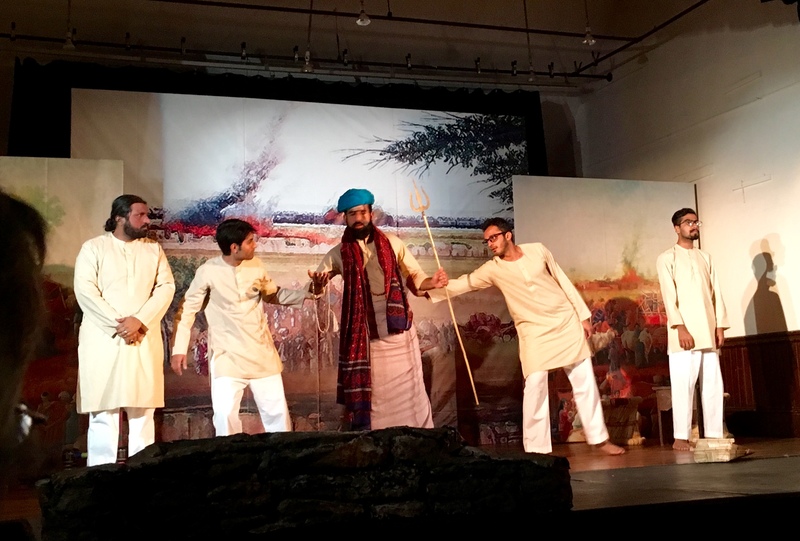 The production effectively highlights the myths that the narratives shattered, including the idea that Muslims and Hindus were always at daggers drawn. “We interviewed about 100 people, and almost all of them started their stories by narrating that they enjoyed good relations with their Hindu/Sikh neighbors. In our textbooks, this peaceful co-existence is never mentioned,” says Khan. Secondly, the narratives broke the myth that people were “dying to migrate to Pakistan”. Lecture performance at The Boston Conservatory. Photo: Theatre Wallay Facebook page. Mulligan and her former student Sarah Morrisette conducted a week-long workshop in Islamabad with Theatre Wallay members on developing dramatic material from narratives based on interviews with Partition survivors. But as they probed, approaching the issue by asking about childhood memories, the elders started opening up. “Almost everyone in Pakistan has a Partition story,” comments Mulligan. In April 2015, the third stage of the project kicked off when Mulligan and Studwell returned to Islamabad and worked with Theatre Wallay to create an original piece of theatre based on the interviews. The next step, and the real test, was to perform before audiences in Islamabad and Lahore in April this year. 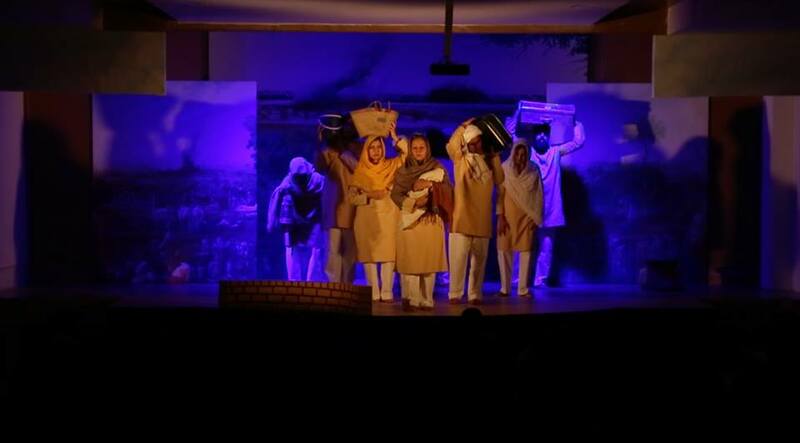 “The show ended to thunderous applause by the audience,” reported the daily Dawn in Islamabad. For the US tour, the actors converted the play’s language, Urdu — various dialects — and Punjabi, into English. The actors’ task was made more difficult by the production’s reliance on monologues compared to on-stage interactions as a dramatic device. The technically sound production features beautiful background music, minimal props and seamless, deftly executed scene changes. Murals from well-known artist Jimmy Engineer’s partition series provide an effective backdrop for the stories that unfold. The production received prolonged applause from full houses at both its performances at Grace Vision Church in Watertown, MA in the Boston area on Saturday. Audiences from the group’s condensed performances and lecture demonstrations at the Boston Conservatory and in Stow, MA, Mulligan’s hometown also attended the show, including her high school drama teachers whom she acknowledged in her opening remarks. 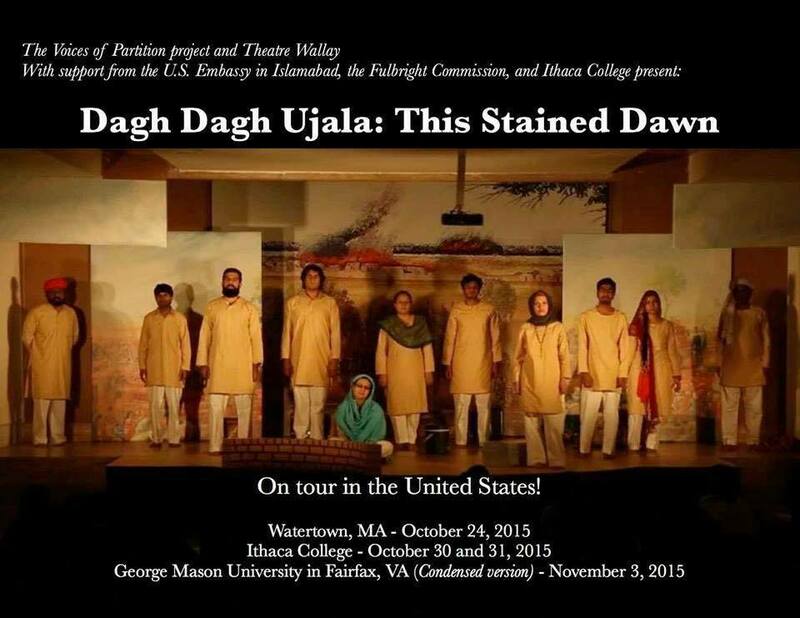 Theatre Wallay’s US tour, starting in the Boston area, ushered the Voices of Partition project into its fifth stage. The packed schedule included a lecture demonstration in the Amherst area on Sunday. The 11 group members participating in the tour have been staying with local host families. Now at Ithaca College in residency for a week, they will perform there on October 30 and 31. Other upcoming performances include condensed versions at the State Department in Washington, DC, on November 2, and at George Mason University in Fairfax, VA on Nov 3. A U.S. Embassy grant and the Fulbright Specialist program have partly funded their trip. The performances and lecture demonstrations are not ticketed but the group is fundraising for 141 Schools, an initiative of The Citizens Foundation (TCF). TCF is a long-running non-profit organisation that builds and runs schools in low-income areas in partnership with communities. The 141 Schools project will build schools named after the more than 141 children and teachers whom militants killed in the Peshawar attack of December 16, 2014. Theatre Wallay wants to connect with organisations in India who want to take the idea forward, she said, adding that the Alliance Francaise in Delhi has expressed interest. Note: “We raised over 1500 dollars for 141 Schools” – Theatre Wallay in a Nov. 2 update on their Facebook page. many thanks. very well written. i was able to see it only after your mother sent me your write up on ruquaiya hassan. i noticed this and read it. my naughty boy hishaam was part of the group. i am trying to reconstruct his impressions of the US visit. Thank you. It was great to see their play here.